Washington -- Peace Corps Director Mark Gearan said January 3 that President Clinton's initiative to expand the Peace Corps would allow the agency to capture the growing spirit of volunteer service across the United States. "President Clinton's initiative to put the Peace Corps on the path to have 10,000 volunteers serving overseas by the year 2000 is one of the most important developments in the history of the Peace Corps," Gearan said. "The President's initiative would result in a 50 percent increase in the number of Peace Corps volunteers. This is a strong affirmation of the contributions of 6,500 volunteers currently serving in 85 countries, as well as the work of more than 150,000 Americans who have joined the Peace Corps since 1961." In his first radio address to the nation in 1998, President Clinton said January 3 that he would ask Congress to increase the Peace Corps' budget to $270 million in fiscal year 1999, an increase of $48 million, or 21 percent, above the agency's current budget. 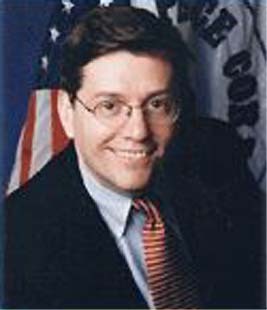 Washington, D.C., January 3, 1998 -- Peace Corps Director Mark Gearan said today that President Clinton's initiative to expand the Peace Corps would allow the agency to capture the growing spirit of volunteer service across the country. In his first radio address to the nation in 1998, President Clinton said today that he would ask Congress to increase the Peace Corps' budget to $270 million in fiscal year 1999, an increase of $48 million, or 21 percent, above the agency's current budget. Gearan expressed confidence that the Peace Corps can meet the ambitious goal of recruiting, training, and supporting 10,000 volunteers by the year 2000. "In recent years we have seen a significant resurgence of interest in Peace Corps service," Gearan said. "Last year, more than 150,000 Americans contacted the Peace Corps expressing interest in serving as volunteers. This is an increase of more than 40 percent since 1994." Gearan also said that the increased interest in Peace Corps service defied popular perceptions about young people and their commitment to volunteerism. "The popular perception about `Generation X' -- that young people are slackers with little motivation -- is a myth. Every day we see more and more young Americans who want to volunteer and make a difference in the lives of other people," Gearan said. Gearan said the Peace Corps has received bipartisan support in Congress, and that he looked forward to working with lawmakers to secure funding for the initiative. "The Peace Corps has been fortunate to enjoy strong, bipartisan support in Congress for many years," Gearan said. "There are three Democrats and three Republicans in Congress who served in the Peace Corps, and Senator Paul Coverdell is a former Peace Corps Director. We are grateful for the support that members of Congress of both parties have provided to the Peace Corps and the work of our volunteers," he said. President Clinton today proposed a new initiative to expand the number of opportunities for Americans to serve as Peace Corps volunteers. This initiative would put the Peace Corps on a path to have 10,000 Peace Corps volunteers serving overseas by the year 2000, a 50 percent increase over the current number of volunteers. The initiative would increase the Peace Corps' budget from $222 million in fiscal year 1998, to $270 million in fiscal year 1999, an increase of $48 million, or more than 21 percent. The President's request is the largest funding increase requested for the Peace Corps since the 1960s. Interest in the Peace Corps is up. A growing number of Americans, young and old, are interested in service. In 1997, more than 150,000 individuals contacted the Peace Corps to request information on serving as a volunteer, an increase of more than 40 percent since 1994. The Peace Corps's "Domestic Dividend" is growing. Since 1961, more than 150,000 Americans have joined the Peace Corps. When they complete their overseas service, many returned volunteers bring a "domestic dividend" by continuing to serve in communities in all 50 states, where they volunteer more on average than most other Americans. Volunteers are addressing critical development needs. With thousands more volunteers serving overseas, the Peace Corps can help more communities around the world gain access to clean water, grow more food, help prevent the spread of AIDS, teach English, math and science, help entrepreneurs start new businesses and work with non-governmental organizations to protect the environment. The Peace Corps has continued to keep pace with dramatic changes in the world. Under the leadership of Director Mark Gearan, the Peace Corps has entered South Africa and Jordan in 1997, and will enter Bangladesh, Mozambique and Georgia in 1998. In 1996, Gearan also launched a Crisis Corps within the Peace Corps, which sends experienced volunteers and returned volunteers to provide short-term assistance following natural disasters or during humanitarian crises. The Peace Corps has always enjoyed strong, bipartisan support. Presidents and members of Congress in both parties view the Peace Corps as one of our national treasures. Secretary of Health and Human Services Donna Shalala and six members of Congress -- three Democrats and three Republicans -- served as Peace Corps volunteers.